Growing up my parents took us kids to an old style pizza house their friends owned. “Uncle” Loren had the best pizza in town to me. I would climb up a small brick staircase onto a platform and watch through a glass window as those skillful pizza guys made our pies. This is where my obsession with pizza was born and nurtured. This zesty sauce recipe is as close as I can come to that beautiful thick sauce. It’s what I make when I want a nostalgic, American style pizza house pie. 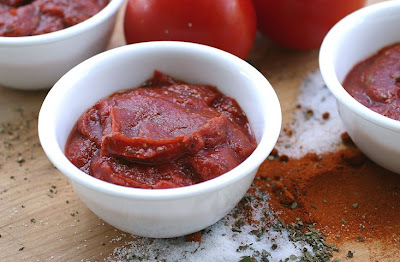 Notes: Because this recipe is so quick to prepare, I keep extra cans of tomato sauce and tomato paste around for spur of the moment pizza nights. Looks great... I tend to just throw my herbs in without measuring, and I've never added vinegar or paprika, so I'm looking forward to trying this. This is very similar to the pizza sauce I posted a while back. I just love your photo today...excellent!! Cool. I'll go find yours Coleen! Laura YUM! I love all the spices in the sauce. I can't wait to try this. I didn't think that your photos could get any better but you proved me wrong with this photo. AMAZING! Amazing photo. I rarely leave comments even though I frequent many many food blogs. I'm thinking of printing and framing that photo. And the recipe looks great too! This looks great! I'm glad to see you make your own pizza sauce, which is paramount to a great pizza! When people take it out of a can, I swear, a little of my dies inside! Hahaha oh the drama! Your comment made my night Chispa! Thank-you! Lol Marta! I hope you have a fantastic Mother's Day tomorrow. I have been looking for a pizza sauce recipe just like this for ever so long! I make pizza every Friday night and I think I'll try this sauce next week. Hopefully it's what you're looking for Jamie. I had been looking for one as well, and just ended up developing this through trial and error. Thank-you Nina! Happy Mother's Day to you too! I would not have thought of putting paprika in the sauce, but now that you've mentioned it, it makes perfect sense! Thanks for this! I've wanted to make my own pizza sauce for a long time but couldn't find a recipe that looked like it would actually be good. This looks awesome! So, I wanted to let you know I tried this sauce and it was *awesome*! Actually, my almost-13 year-old daughter mixed it up for me... I will go a little lighter on the garlic next time, but that's just my personal preference. I'm going to post a link from my blog so I can show everyone how great it is! Thanks! I'm so glad to hear that. You're the first person to get back to me on this one, and I was starting to think noone liked it lol. Hi Laura, I wanted to tell you I've had a couple people try your pizza sauce (following the link from my blog) and they loved it! Happy day! I finally got around to using this recipe today--we had veggie pizza with the Wolfgang Puck crust & fresh mozz--it was SO good! Thanks for sharing this recipe--it's nice to be able to whip up my own sauce instead of buying pre-made! I just made another pizza with this sauce--it's so crazy-easy to throw together and so much cheaper than buying a jar (what I used to do). And I love the flavor! I will use this recipe over and over again. I am just starting out cooking and learning to make things from scratch. I am loving it and having a total blast. My boyfriend and I LOVED your pizza sauce on our pizza. I used fresh oregano, basil and garlic instead of dried but it came out so great. Thank you!!! I will keep this one in my books for sure! Jess thank-you so much for leaving a comment! I'm super excited you like this sauce. I use it almost every week and am grateful someone else is using it too now! I recently found this recipe, and it's fantastic! Thanks for sharing. I made this sauce last week and it was insanely good. This is now my go-to pizza sauce recipe. I especially love it with fresh mozzarella, oh man. Can't wait to make it again! Thank you for sharing! I found you through the Pioneer Woman (the purple pizza intrigued me). I am on your site because I torn my recipe collection up looking for the pizza sauce recipe I printed from you forever ago. Lost it and was in a panic. I found your site again. Wow. Marking it this time...... I throw red pepper flakes in it.. I'm from Texas.